This recipe for baked spareribs is super easy! Just top the pork ribs with a balsamic vinegar barbecue sauce and bake them to tender perfection in the oven. The meat literally falls off the bone. If you like char on your ribs, you can finish them on the grill or under the broiler. The easy barbecue sauce is a tangy delight. Whip up a batch to use for other meats and seafood. This cooking method will also work on beef ribs. Heat oven to 325 F. Select a large baking pan to fit ribs in one layer. Line with heavy duty foil. Place baking rack (a cake rack works fine) inside lined pan to keep ribs from resting on the bottom of the pan. Remove the thin membrane (silverskin) from the back side of the ribs (if not already done by the butcher). Sprinkle both sides of the spareribs liberally with onion powder, garlic powder, salt and pepper. Place seasoned ribs, bone side down, on the rack in the baking pan. Prepare the sauce by combining lemon juice, bottled barbecue sauce, ketchup, balsamic vinegar, and hot sauce (if using) in a small bowl. Stir vigorously until combined. This will make about 3 cups of barbecue sauce. Pour half of the sauce into a separate container and set aside. Drizzle remaining sauce over the top of the ribs, covering all exposed areas. Cover pan tightly with heavy-duty foil. Bake about 90 minutes to 2 hours, or until tender. 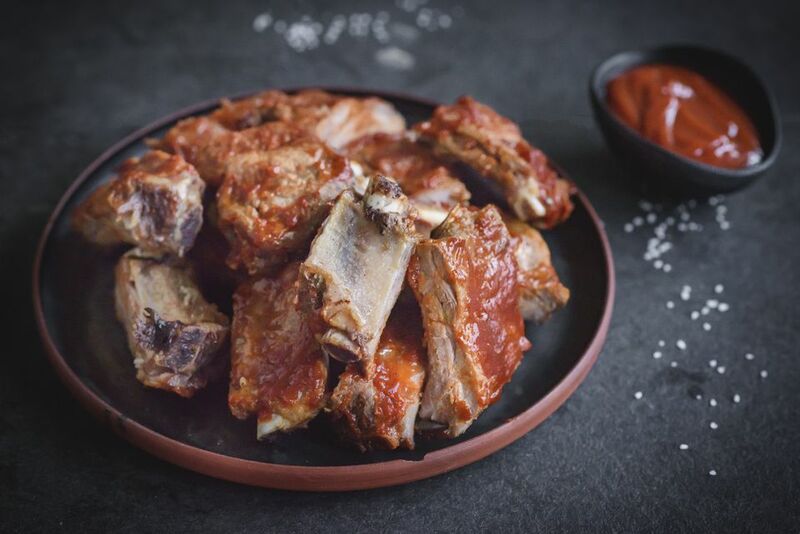 Serve spareribs with reserved barbecue sauce. After cooking the spareribs in the oven, you can also char them on the grill or under the broiler before serving, if you wish. This adds a nice little crust, which pairs very well with the tender cooked ribs. So What Are Spareribs Anyway? Spareribs are a pork cut from the bottom section of the ribs and breastbone of the pig, just above the belly. Baby back ribs are from the top of the rib area along the back. They are not as meaty or succulent as spareribs. As bacon is removed, a thin layer of meat remains on the spareribs. The term comes from the German "rippenspeer," which literally translates to "spear ribs," as this cut was traditionally roasted on a spit or spear. In English, it became ribspare and eventually sparerib. This term not only refers to the practice of roasting the meat on a spear or spit, it is also a perfectly reasonable description of the cut itself. You will see this cut referred to as spareribs (compound word) and spare ribs (two words). Both are acceptable.